Any DVD Shrink is the best copy DVD movie software for decrypting and copying any DVD movies to PC hard drive or blank DVD disc, or burning the DVD movie to ISO for backup purpose. Compared with other DVD clone software in the market, Any DVD Shrink is well-known for its all-in-one feature - combining decrypting, copying and burning into one software with excellent stable performance! Its function is so powerful that when you want to backup your precious DVD movie or compress DVD movie to save your storage space, Any DVD Shrink is just the right tool, as Any DVD Shrink has provided all the functions that you needed mostly, such as copying, burning, shrinking and erasing rewritable discs. If you own Any DVD Shrink, you can handle your valuable DVD movie freely and effectively, no need to have any other similar products. In a nutshell, it is an excellent choice for both beginners and advanced users. If you are the owner of a large collection of commercial DVDs, you may have discovered, depending on the version of Windows and the media player you're using, you may need to download additional codecs just to be able to play a commercial DVD on your computer. But playing the DVD is one thing. Copying it to a file you can edit on your computer is another. Just search the Internet for "rip commercial DVD", and you'll find a number of applications that are capable of ripping commercial DVDs, copying them to your hard drive in various file formats, and even removing region restrictions on playback. Any DVD Shrink is the one that can help you remove region code from css protected DVD, and backup commercial DVDs to hard drive, ISO Image File or new blank discs. Once you've copied the entire DVD or main movie of the DVD to your computer using Any DVD Shrink, you can load the VOB files into a video-editing application. If you want to perform only basic editing tasks, you might find Windows Movie Maker up to the job. The program is delivered with Windows Vista and is available for free download if you're running Windows XP. If you need more powerful tools, you may want to buy a full-featured video-editing program. What are the more powerful tools? While Windows Movie Maker allows you to stitch together videos and apply titles and transitions, it doesn't offer tools for batch processing, lining up multiple audio tracks with video tracks, etc. Here, we would like to recommend Movie DVD Maker. Whether you use Windows Movie Maker or a third-party video-editing program, you'll be able to save your edited files in a format capable of being played either on your computer or on a DVD player connected to your television. If you want to enjoy the DVD on your portable devices, such as iPod, iPhone, PSP, BlackBerry, etc., you need to get a DVD Converter. Download and install Any DVD Converter. It can rip DVD, convert DVD movies and multimedia files from any supported format (including AVI, ASF, WMV, MOV, MPG, MPEG, MP4, DivX, FLV and more) for portable video devices, MP4 players and smart phones. Secondly, you should set the input and output devices for Any DVD Shrink. By Any DVD Shrink you can choose input device or output device at the bottom of Any DVD Shrink. Input device is your DVD-ROM, output device can be ISO image file, DVD folder or DVD-ROM if you have multiple DVD drivers. 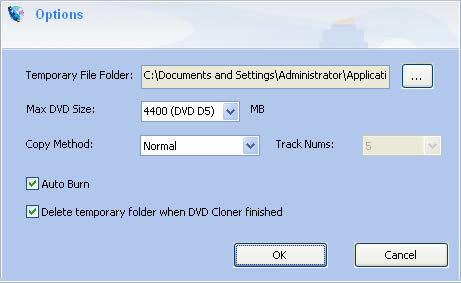 Thirdly, set cloning Option in Any DVD Shrink, through this setting, you can decide which type of DVD disc you want your DVD movie to be stored in or just copy DVD movies to PC hard drive in ISO image file or DVD folder. At last, you can click "Copy DVD" button in toolbar of Any DVD Shrink to clone and backup you DVD movie or burn them into DVD discs including DVD-9, DVD-5.